Wendy Glauser writes about health and science in Toronto. Mike never thought he’d inject heroin into his own son’s vein. Now based in Toronto, Mike has used heroin and various other opioids off and on for over a decade. He’s been to jail, he’s been homeless, and he has lost friends to overdoses. A few years ago, Mike found his teenage son sitting on his kitchen floor in his underwear, with two needles in one arm. There was blood running down his arms and his legs, and he was bawling from the head-exploding, gut-wrenching pain of withdrawal. Mike injected his first-born that day, just as he would a friend or regular user. This wouldn’t be the last time he helped another person inject. Mike, whose name has been changed to protect his and his son’s identities, is one of the many volunteers at the overdose prevention site in Toronto’s Moss Park, a downtown neighbourhood that is home to some of the city’s most marginalized. Volunteers set up the then-unsanctioned site in 2017. That same year, there were more than 1,000 opioid overdose deaths in the province of Ontario, nearly a 55 percent increase from the year before. That’s largely due to the explosion of fentanyl, an opioid that can be fifty times more potent than heroin. 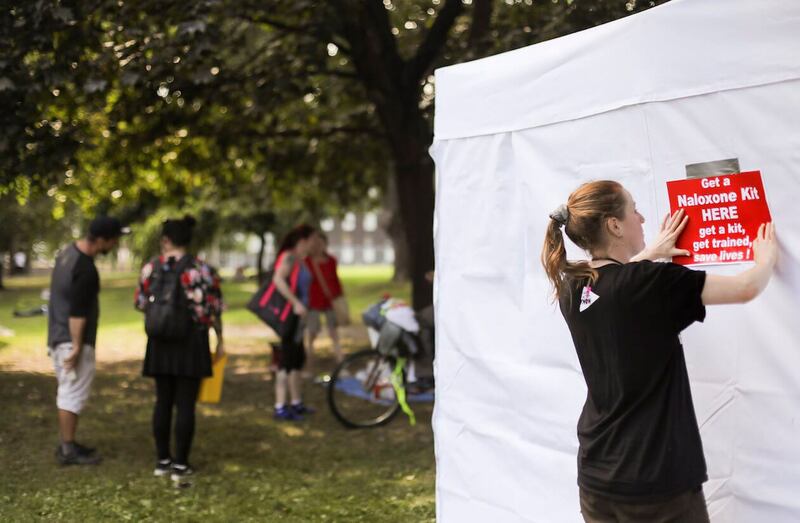 At Moss Park, and other overdose prevention sites in Canada, volunteers are working to stem that tide. There, volunteers hand out new needles, supervise people injecting themselves, and treat and reverse overdoses with oxygen and naloxone, an overdose-reversal medication. Volunteers operate under a harm-reduction philosophy: a concept rooted in the understanding that addiction is often long-term and reducing the harms associated with drug use, including infection and overdose, can prolong, and even save, lives. Recently, in recognition of Toronto’s need to curb opioid overdoses, and fentanyl overdoses in particular, the Moss Park site started receiving funding from the provincial government; sometime in early July, the Moss Park site will move from its trailer location to a nearby building. The site has become one of the first in Ontario to legally offer peer-assisted injection—a huge step toward expanding harm-reduction when it comes to addressing Canada’s opioid crisis. “I’m making history,” says Mike. But history is far from made, and there may be some unexpected hurdles to contend with. In Ontario, all of the overdose prevention sites were funded by the previous provincial Liberal government for a temporary period of three to six months. About a half dozen have been approved and are already operational or are just about to open their doors. Meanwhile, the new premier of Ontario, Doug Ford, has said he is “dead against” injection sites, and many fear he may close them down. At the same time, there is some indication the federal government may heed the call for peer-assisted injection at the supervised-injection sites it funds across Canada. In early June, Health Canada gave exemptions to six supervised-injection sites—out of nearly thirty currently approved sites—to allow peer-assisted injection on a pilot basis. It isn’t enough, say some harm-reduction workers who contend that peer-assisted injection should be permitted at all sites. “I’ve heard so many examples of people who have been forced to leave a supervised-injection site and go somewhere else to get injected because they were having a hard time injecting themselves,” says Marilou Gagnon, a registered nurse and president of the Harm Reduction Nurses Association. If a person is, for example, in a public washroom or alley, and if they’re rushing while trying to inject, the chances of getting an infection are higher. If they overdose, they might not have anyone around them with overdose-reversal medication, and they could die. “Some people are really in withdrawal,” explains Sarah Ovens, a harm-reduction worker in Toronto who has volunteered at the Moss Park site. “They’re shaky, and they’re having a horrible time. Over and over, they’re trying to get their shot.” With each attempt, they can bring more bacteria into their blood and tissue, which can lead to abscesses under the skin, sepsis, and possibly even endocarditis. That happens when bacteria that enters through the blood stream spreads to the heart, causing inflammation and severe illness. Endocarditis often requires intensive antibiotic treatment, delivered through IV over weeks in the hospital, explains Gagnon. It can be fatal. Aside from increasing the risk of things like overdose and infection, prohibiting assisted injection is also discriminatory. Research shows that specific vulnerable groups—namely women and people with disabilities—are much more likely to need assistance with injecting. “You can’t really make your service only for people who have the knowledge and ability to inject,” says Gagnon, who called for assisted injection to be allowed in a 2017 article in the Canadian Medical Association Journal.